Weather was introduced into Andatura 4 on 5/5/2016 to both greatly improve the viability of safety upgrade parts and implement some more variable conditions to the game. There are generally two options to deal with weather; add safety parts or ignore it and hope for the best. 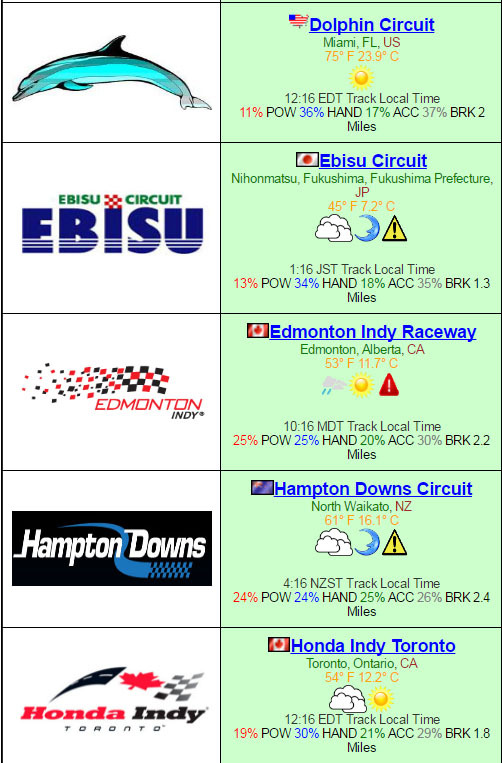 The “weather par” is the safety skill desired for a track based upon track conditions. If the car is below the safety par, the car loses -0.5% and 4% per .01 the car is below safety par. Base par is 0.95. This means a car will perform fine in normal weather conditions without any mileage penalties. Safety for the vehicle is impacted by set bonuses, research points and mileage so it is possible to deal with lower safety pars with set bonuses and research points alone. Weather is “updated” every 2 hours based upon real world conditions. A forecast may be viewed by clicking on any of the weather icons or the “weather forecast” link. Because both the forecast AND conditions are used from real world conditions and forecasts, the closer a forecast is to the actual date - the more accurate the forecast tends to be. Entering your car a week+before a big season race is inadvisable unless you feel like playing dangerously. If the local track time is between 6:00-19:00, it will be day -otherwise it will be night. Checking the start time is important to determine if there is a base safety par required for night. Some tracks can start in the day and end at night or visa-versa depending upon the track length and how many laps the track has. The extensive testing is now compatible with the weather par system. It shows how the car performs with CURRENT weather conditions on the track. You will receive messages from your racing team when your car is racing on a track BELOW par conditions. This is ONLY messaged ONCE per race. Note : You can disable this message from being sent to your from the garage page underneath the Hide Weather Notifications? option.